Calling all youth singers and performers! Hollywood Launch Academy of DFW hosts FREE Vocal and Performance Workshop with L.A.'s top talent expert Jonathan George. DALLAS – Aug 5, 2013 - Jonathan George, a native of Dallas and CEO of JG Entertainment in L.A., coaches the top youth talent on Disney, Nickelodeon, MTV, Universal, Sony and more. His own professional career gave way to his passion for developing young talent into triple threat competitors in voice, acting and dance. From TV/Film segments, to stage acting and studio CD production, Jonathan George knows what it takes to be an entertainment professional. Ages 8-21 with vocal talent are invited to take advantage of a FREE performance workshop with Jonathan on Saturday, August 17th from 11 am – 12:30 pm at Frisco Discovery Center. Jonathan will be teaching the inside secrets of nailing a singing audition. His students have used these secrets to be on just about every talent show on TV. Attendees need to prepare one minute of a song acapella. After the workshop, Hollywood Launch Academy of DFW will host their Fall Semester Auditions beginning at 1 pm. 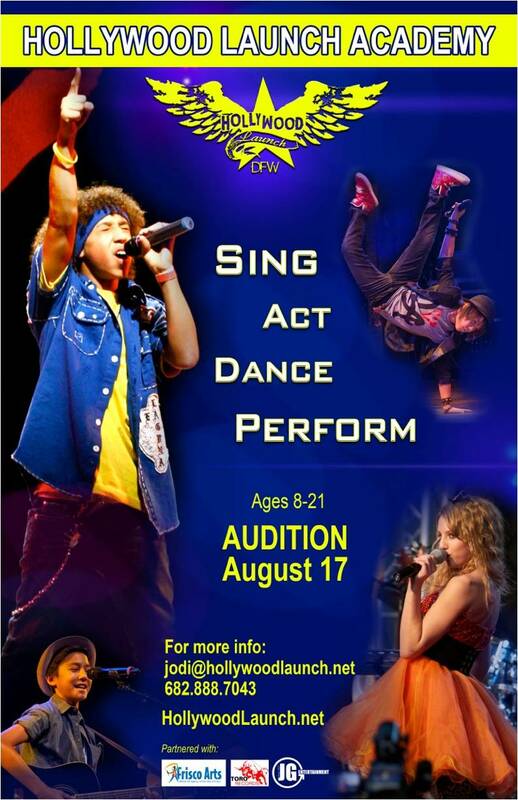 Pre-register for FREE workshop and/or audition: Jodi@hollywoodlaunch.net or 682.888.7043. *Workshop and Audition are separate events. Scholarships are available to attend fall semester at Hollywood Launch Academy of DFW! Highest scoring performers at the auditions will be awarded a SCHOLARSHIP and/or PRODUCTION DEAL with Toro Records/JG Entertainment. Fall Classes for Hollywood Launch Academy of DFW begin September 21st at the Frisco Discovery Center! FOLLOW Hollywood Launch on Twitter! Are you dying to know if your child has natural talent? How do you nurture that talent? What is the next step? How does a parent identify the child’s natural gifts? Parents: Pay attention. Provide exposure to a variety of activities, especially those that the child is naturally inclined toward. It’s not necessarily what the parent was good at or interested in – you’ll see it if you pay attention and let the child decide. What you don’t want to do is have the parent unconsciously projecting their unfulfilled dreams onto the child. How do parents nurture that gift? How do you go about finding the right team? Nurturing comes with providing support without pressure. Parents need to research and provide outlets for the child. With technology you can find every possible opportunity. Once you find the outlet, make sure that the child learns to be accountable for their commitment for the short term, encouraging them throughout the process without pressuring. Finding the right team: It’s critical to create the right “team” between the child, teacher/coach and parent. Find a teacher or coach you feel comfortable with, who isn’t intimidating to your child, but who you respect and trust. A child has to feel safe to expose their weaknesses in order to grow. If someone feels intimidated they won’t grow. They have to trust the teacher. The parent has to let that bond develop. How do you help manage your child's desires and abilities without damaging the relationship between parent and child? There’s a big difference between being a Momager/Popager and being proactive on behalf of your child’s best interest. There are a lot of parents who are smart business people, managers, etc – they know how to do it in their professional lives. The problem is your child is not “a business” – he or she is a person who is part of a team with coaches paid to lead them and guide them. It’s important for the parent to stay heavily involved in the process, but they have to be a parent #1. If they start bulldozing for their child, there’s a problem – either with the parent’s ego, the child’s true interest, or the coach. It has to be addressed up front and change direction if it’s not working on all three fronts. What if my child has talent but is not the "best" or "top" competitor, what do I do? The world is made up of a majority of people who are not the #1 best. We have to keep developing and work with what we are given. We want our child to figure out a way to be great and find a way to express the gift, solo, or as part of a team. There are many points of view out there – there will be an opportunity to match a child’s gift for a need out there. Developing a talent is about learning, growing and becoming better at life. It’s so important that you keep your child growing – they will find their way. Kids come to me and they are not the best singers – they will be among the majority of us who don’t become Beyonce, but the gift is in the process, learning to be part of team, build their work ethic, self confidence. Be a superstar in their own lives. If your child doesn’t get the role, make the team, gets an injury that prevents further play - the whatever because life happens – You have to help them trust the process. We may not know the reason or outcome for years. While in the short term it may be really disappointing, you have to help the child realize he is not “what happens” to him – he is WHO he is – an amazing person with a purpose in life. Sometimes my kids are disappointed in not getting cast in a TV show, and later it turns out that the show bombed anyway and it would have not been a good experience. They were then actually available for a better opportunity down the road. Life works out that way most of the time. Attention! Calling all aspiring singers and performers! L.A.’s renowned talent expert Jonathan George seeks youth ages 8-21 with vocal talent to audition for professional development in singing, acting and dance at Hollywood Launch Academy of DFW. Scholarships to study with Jonathan George available! Highest scoring vocalists awarded a SCHOLARSHIP and PRODUCTION DEAL with Toro Records/JG Entertainment.